This building is anticipated to receive a Tax Exemption through the 421a Tax Incentive Program of the New York City Department of Housing Preservation and Development. Individuals or households who meet the income requirements listed in the table below may apply. Qualified applicants will be required to meet additional selection criteria. General preference will be given to New York City residents. Eligible buyers should have 10% of the purchase price available for down payment. Please note that the quoted sales prices, maximum household income, asset limit, etc., are estimated and are subject to change. EACH BUYER MUST OCCUPY THE CONDOMINIUM APARTMENT AS THEIR PRIMARY RESIDENCE. ANY PROSPECTIVE APPLICANT WHO CURRENTLY OWNS OR PREVIOUSLY HAS PURCHASED A RESIDENTIAL PROPERTY IS INELIGIBLE. ** Income guidelines subject to change; larger down payments may allow for lower minimum incomes. 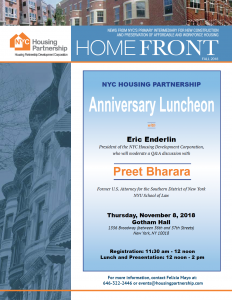 To request an application by mail, send a self-addressed envelope to: 235 55 Street Condominiums, c/o Housing Partnership Development Corp at 253 West 35th Street, 3rd Floor, NYC NY 10001. Only send one application per development. Do not submit duplicate applications. Applicants who submit more than one application may be disqualified. Completed applications must be returned by regular mail only (no priority, certified, registered, express, oversized, or overnight mail will be accepted) to an address that will be listed on the application. An Informational session will be held on April 24th at 6:00-7:00pm at Brooklyn Community Board #7- 4201 4th Avenue, Brooklyn NY 11232. Seminar attendance is not mandatory to purchase a Condominium. What Happens After You Submit an Application? Applications are processed in log number order based on set-asides and preferences order that they are received. If yours is selected and you appear to qualify, you will be invited to an appointment to continue the process of determining your eligibility. Interviews are usually scheduled from 2 to 10 months after the application deadline. You will be asked to bring documents that verify your household size, identity of members of your household, and your household income. THE COMPLETE TERMS ARE IN AN OFFERING PLAN AVAILABLE FROM THE SPONSOR FILE NO. CD-140060. This advertisement is not an offering. It is a solicitation of interest in the advertised property. No offering of the advertised units can be made and no deposits can be accepted, or reservations, binding or non-binding, can be made until an offering plan, as filed with the New York State Department of Law is provided to an eligible applicant. Sponsor: Ming Gui Realty, LLC, 6802 Narrows Avenue Brooklyn New York 11209.